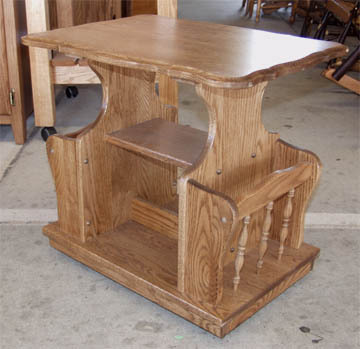 Our Amish magazine stand is made of solid oak and will look great in your living room, family room, den or wherever you need a magazine stand. Featuring legendary Amish quality, our oak magazine stand will fit into any decor, easily doubling as an end table with added storage features. It features an attractive table top with routed edge and a handy shelf beneath, magazine racks on both ends, and a divider across the base so you could put your books down there and keep them neat and orderly. To top it all off, hidden underneath are a set of casters - making it easy to move it about in the room as needed. What more can you ask for in a magazine stand - the Amish have thought of it all!